What more could a statue wish for than to live in the Middelheim Museum? The park offers space for every sculptural desire, a leafy environment where people can freely appreciate the quality of the works. The Middelheim Museum is a democratic community in which all the statues have the same say. A protected place, where polite conversation about art can be pursued. Yet something is not quite right. Wandering through the woods, strolling over the green lawns, moving from one sculpture to the next, the wood becomes oppressive, the green lawns sinister. The statues seem uneasy. And what is to be made of the open-air depot, where statues that were no longer welcome in the city are piled on rickety pallets. There the Franse Furie (French Fury) is laid low, accompanied by defunct symbols of fame and honour. The feeling of uneasiness is clearly expressed in the Model for Sculpture Zoo (2006) by Thomas Schütte. Here, Middelheim is suddenly a zoo for exotic art on the point of extinction: sculpture can be displayed there in all its glory, but its freedom is at an end. This work by Schütte is one of the few sculptures that examines the situation in the park, that reflects on the place art can occupy. It is a sculpture, yet simultaneously it questions its existence as sculpture. 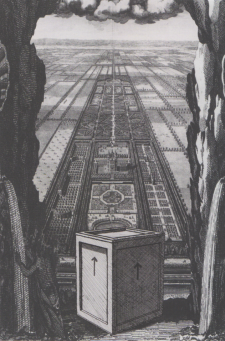 When the Middelheim Museum opened in 1950 the mayor and man behind the initiative, Lode Craeybeckx, expressed the wish that the park would form a sort of sally port for the city’s statues and that the whole of Antwerp would become a Middelheim. That wish was not fulfilled. Though Antwerp is indeed a city whose public spaces are well stocked with sculpture, the role of art there is limited. By and large, the statues are more or less traditional works, and at first sight are chiefly decorative or commemorative. Although Middelheim has officially been a co-arbiter of artistic policy in the city’s public space since the nineteen-eighties, there is not much evidence of it. What is chiefly evident is the yawning gulf between the collection in the Middelheim Museum and the collection in the city. It is precisely as if the city has long regarded Middelheim as an excuse for needing to do little or nothing about including contemporary art in its urban landscape. That has consequences for the nature of the public space. One of the few works to break out of the classic pattern is Jan Dries’s 1985-86 Meditatieve ruimte – Het zelf zijn (Meditative Space – Being the Self). Using a formal idiom that seems to stem from American minimalism, Dries set the entire Theaterplein – the large square in front of the municipal theatre – in motion. The rising and falling corners of the central plane form an unstable, unbalanced stage, as it were, on which the spectator can be an actor for a moment. The work is not on a pedestal but is itself a base for the dynamic of city life. In the way it impacts on the environment and the people who set foot on the square and influences them in their pattern of movement it recalls the so-called ‘environment designing’ with which, in the Netherlands, the artists of the Arnhem School sought to combat the monotony of functionalistic new architecture. But it does not make the same mistake as they did. In the nineteen-seventies, as a result of the Arnhem School’s popularity, a hail of steel, concrete, brick-built or cast objects and forms descended on Holland’s public space. They were especially popular with the city’s administrators and other governmental commissioners who intended in this way to serve both culture and the municipal weal. They were not terribly popular with the users or inhabitants of those areas hit by this deluge, but these people were certainly considered, albeit mainly subconsciously, to undergo the salutary stimulation of the formal impulse in their neighbourhood. Dries, on the other hand, and as the title suggests, is concerned with conscious reflection. And he expresses that concern by entering the battlefield of public space with the right scale and proper dynamic. In 1974, for the Belgische Beeldhouwkunst in Middelheim (Belgian Sculpture in Middelheim) exhibition, Dries produced a smaller version made of grass and ridges of earth. It differed considerably from the work he would design for the city ten years later, however. Harder materials and an increase in scale turned the Theaterplein version into a work that would not be at all at home in Middelheim. On the Theaterplein the work was no longer an experiment in land art but an urban intervention whose language of movement and confrontation would be incomprehensible in the sculpture park. But apparently the tone of this work was not harmonious enough for the city’s present administration: Meditatieve ruimte – Het zelf zijn was removed when the square was re-laid. Of course, this happens often enough. In Antwerp’s history any number of statues have disappeared from the city’s collection, shuffled under the municipal carpet or passed on to private individuals on indefinite loan. This is unavoidable; a city can’t renew itself without some clearing up. Indeed, that’s often a precondition for the creation of a better public space. What is distressing in this case, however, is that it happens to a work of art that is itself an attempt to modernize that townscape and to make Antwerp a city whose public domain does not seem to have come to a permanent standstill. That the city has problems in dealing with art that aims to operate at this level is clear from the equally distressing events attending the work of Dan Graham, as we shall see below. Some of the more recent works in the Middelheim collection display a transition from pedestal to stage that is similar to that shift in the work of Jan Dries. These are works of art that are not purely sculpture, that can’t only be viewed by moving around them, but that try to involve the viewer physically. The spectator experiences these works by becoming a visitor. Luc Deleu’s Orbino (2004) is a good example. Deleu’s usual stack of containers can be mounted and entered, and it acts as a look-out point from which the area can be surveyed. But its unstable form makes it something much more than that. It is also an architectonic intervention, and in that sense it alludes directly to the city, which is hard to find here in the sculpture park. And like the work of Jan Dries, Orbino elaborates on ideals of the nineteen-seventies. But here in Middelheim the ‘utopian-anarchistic implementations of the city’ with which Deleu is concerned are in the background. Not so much because Deleu has repudiated his ideas, and, like so many, used the eighties to dump each and every utopian perspective, but because the context from which the intervention derives its power is missing. And in the absence of the city the user remains a spectator, the city-dweller an art-lover, Orbino a sculpture. There are more works whose eloquence is muted by the lack of an urban dynamic. In Antwerp’s urban space Per Kirkeby’s brick labyrinth, Chris Burden’s Beamdrop Antwerp (2009), and Guillaume Bijl’s Romeinse Straat (Roman Road) (1994) would all gain an extra undertone that here in the sculpture park they convey only as a vague allusion. What they really could do there, they do only partially here, and that is mainly because the spectator is on his guard. He does not come upon the work unawares but comes to visit, and therefore the exchange remains polite. The viewer is not smitten with the confusion that the surprise of an unexpected confrontation would have created. In the city context the chance of confusion these works could create is mainly due to the fact that they are not immediately recognizable as art. Most of the statues that were made before the nineteen-sixties and seventies, both in the city and in Middelheim, wear their artistic character quite blatantly. They stand imperturbably on their pedestals, insensible to their surroundings. They may affect, surprise, irritate, elevate or embellish, but only after they have already been observed as works of art. And although they are primarily installed with decorative or educational purposes in view, they also fulfil a role in defining the public domain. For however innocent in their representation the bronze and stone statues in the city may be, they certainly represent the administration’s immutable grip on the site in question. The statues confirm the presence of the town council or other governing body that has erected them. They indicate that the public space in that spot is part of the public order and that not just anything can take place there, that the site has turned into a specific domain. From the moment that works of art relate clearly to a specific spot and later even to specific circumstances, however, their role vis-à-vis the public space changes. The works are then less immediately recognizable as art, but for that very reason their power to exercise a degree of influence on the way a particular environment is observed is also stronger. In Middelheim, Luc Deleu’s containers are inexorably sculpture, whereas in an urban landscape they occupy a position between an accidental shelter, a reminder of the port, and something that we cannot immediately put a name to but that could perhaps be art. The art-endorsed assumption of power is called into question when the work steps off its pedestal and, in the middle of the public space, creates an opening in which new meaning can originate. If you were to come across Guillaume Bijl’s Romeinse Straat in the city centre, or even somewhere in a distant suburb, it could indeed be a piece of dug-up history. Proof of Antwerp’s glorious past or paradigmatic heritage obsession. Kirkeby’s structure could look like a perverse cross between a chapel and a urinal, and Burden’s Beamdrop Antwerp like a building project from some vague past that has got completely out of hand. That these works wear away their days in Middelheim and can never venture into the city is the result of predictable objections: dangerous, vulnerable, uncontrollable and unclear. The most important but unarticulated objection, however, is more likely the infringement or disturbance of a public order that the very presence of art should assure. Like a number of the abovementioned works in Middelheim, Dan Graham’s Belgian Fun (2004) seems to lead a somewhat forlorn existence. The aim of this public hall of mirrors was to reflect social relationships and structures, but here it reflects only the other sculptures that inhabit the park. Originally, however, it was intended for the large square called the Sint-Jansplein, where it was installed in 2002 with the title Funhouse for Children of the St-Jansplein. The events surrounding its installation on that site suggest that politicians have good reason to distance themselves from works of this kind, that involve the public a tad too explicitly. Some of the square’s residents took the invitation to regard the work as part of their environment, to step onto the stage and occupy it, a little too literally. Even before the work’s opening, the green carpet that covered the floor had gone, and pretty soon afterwards the rest of the Funhouse followed. Was this a question of a poor choice by the commissioner, a bad design by Graham, or a complete lack of understanding by the local population? To start with the last: residents rarely if ever like contemporary art, especially when it’s parked pontifically on their doorstep. Residents tend to like what they’re already familiar with, and contemporary art is inclined to differ from that. The residents don’t even have to like art: they are neither happier nor richer for it and their neighbourhood is not noticeably improved by it. But a city may well like contemporary art, and its politicians can make this manifest by giving it space there. This space is not merely physical, however; it is not enough to indicate a site in order to situate a complex work. The work’s inherent ideals must be allowed to unfold and that can only happen by making it clear that those ideals relate to the residents. So long as the work seems to be no more than the whim of potty politicos who are badly advised by their overpaid experts, it doesn’t stand a chance. But there is also the question of whether the Funhouse could have survived in the first place. A work of art not only embodies ideas and ideals, it not only depends on careful siting and possible embedding, it also acquires significance through context and previous history. As Michel de Certeau has already said, the strategic occupation of public space has panoptic effects. When a square, the Sint-Jansplein for instance, is in the process of being re-laid, it is not only taken out of its residents’ control and placed under the power of the local authority – an operation that is usually rounded off with the installation of a work of art that looks as if it will be sitting there forever – but is also subjected to a watchful gaze which, without being visible itself, aims to keep a close eye on everything. Nowadays, of course, authority no longer needs art for such surveillance, but Graham’s work certainly bore very emphatic traces of this panoptic intention. Perhaps the work could really have been handed over to the square’s residents and users as a symbolic reversal of the roles of guard and guarded. It is, however, more likely that the implicit panoptic intention is indeed part of the commissioner’s subconscious agenda and that the residents understand that very well. In Middelheim Graham’s work is protected against vandalism. Thus the museum functions as a sanatorium or rest home for art that seeks asylum from the violence of the public space. There are other works there that would find it hard to survive outside. The endearing nest of Patricia Piccinini’s young scooter (Nest, 2006), De Soto’s coloured concrete-reinforcing bars (Double Progression Vert et Blanc, 1969), Pedro Cabrita Reis’s neon tubes (The Passage of the Hours, 2004), Kati Heck’s voluptuous sausages (Dabei sein ist Alles, 2006), Thomas Schütte’s hanging tongues (Tausend Zungen, 1993), all these works seem unlikely to live long in the manic life of everyday. Even the robust bronzes of Moore, Arp and Chadwick would no longer be certain of survival, given the ever increasing price of copper. So protection does not seem to be the main explanation for the differences between the collections of the museum and the collections of the city. Rather, it is the nature of the work of art that determines whether it is deemed suitable for Antwerp’s public domain. Any departure from the more traditional form of sculpture stands little chance. Even if a contemporary work from Middelheim does make the crossing to the city it must bow to the dominance of tradition. Yoshitomo Nara’s Puff Marshie/Antwerp Version (2006), which in the exhibition in Middelheim lay gleaming seductively on the lawn, has landed on a pedestal in the city. Thus, for art in the city, the rule is that anything that is not on a pedestal is still kid’s stuff. And so the city not only deprives itself of the possibility of creating a public space that is creative and lively, but also establishes the image of a city in which everything is set in stone and where deviation is viewed with suspicion. Apparently, therefore, the city resists art that potentially puts its inhabitants on a pedestal or provides them with a podium. And in doing so it excludes the ideal that tries to see public space as a shared space. Conversely, however, you could say that in Middelheim the ideas and ideals implicit in more traditional forms of art can only be seen when it’s there. The very fact that in the museum they don’t have to contend with their surroundings allows works by Arp and Lohaus to express their intent. When they’re not shouted down by an environment that attempts to reduce everything to functional and thus negotiable design these sculptures show their hope of a different and perhaps better world. In the public space abstract sculptures quickly become meaningless characters, stiff signposts to nowhere. In Middelheim the abstract can become meaningful and the memory of the dream survives. It is that very isolation in the museum that enables us to be aware of things that in the lived-in environment could all too easily be appropriated for inappropriate messages. Kati Heck’s shiny sausages would soon end up in the hands of a terribly jolly butcher; the mystery of Honoré δ’O’s work (Shouting is Breathing in Circumstances, 2006) would be lost. Although it would certainly be worth seeing just how these artists might affect the urban space, their work is in the right place in the Middelheim Museum. Middelheim can show what art can mean without that meaning being used and exploited by the good intention brigade who prefer that art should have an immediate function. For that’s the danger when the work of art leaves its pedestal and mixes in the city bustle: the possibility that something may happen is often seen as requiring that something should happen. Works of art that create a possibility are required to actually fulfil that possibility. Outside the park, Ann Veronica Janssens’s Tennismuur (Tennis Wall) (2003) would be no more than a tennis wall, for instance; an attempt to promote the need for sport and to bring disadvantaged groups into contact with higher forms of movement. Because the wall should be used, not using it would be a sign of failure. Here in Middelheim, however, the wall’s very uselessness is its strength. Of course, one can use the wall (‘Anyone for tennis? Racquets and balls are ready’), but empty and deserted it distances itself from a pressure to participate that threatens to become overwhelming. Here the game is shown as a possibility. And, like the game of tennis at the end of Antonioni’s Blow Up, that possibility is more real than the real thing. Published in: Crossing, From Middelheim Museum to the City and Back Again, Antwerp, 2011. Michel de Certeau, The Practice of Everyday Life, University of California Press, Los Angeles-London, 1984. Cel Crabeels, Nearly Present, Just Past, documentary, 2004. Johan Pas, ‘Museum zonder muren’, De Middelheim Collectie, Ludion, Antwerp, 2010. Antoon van Ruyssevelt, Stadsbeelden Antwerpen Anno 2001, Stad Antwerpen, Antwerp, 2001.